It's become clear in the past year or so that one key "target" in the legacy entertainment industry's game plan is to force Google to change its search results to have "good sites" rise up and "bad sites" be pushed down. They've been putting pressure on search engines for quite some time now, and have even considered suing Google for not giving it the results they want. Late last year, the RIAA even put out a "report card" in which it complained that Google won't let them program Google's results for everyone else. This whole focus is a dumb idea for a few reasons. Mostly it's dumb because it (again) misdiagnoses the problem. It assumes, for example, that the reason that people go to file sharing sites is because the results top Google. But that's rarely the case. In fact, if you do searches for various tracks or movies, you'll almost always find legitimate results at the top already. The "issue" comes up when people do those searches in combination with "free" or something along those lines. But, by that point (in most, but not all, cases) the industry has already lost those folks. At that point it's likely that they know they're looking for an unauthorized version, so seeing a more "legitimate" result at the top of the results isn't likely to make much of a difference. Even if we assume that the industry's theory that Google is magically driving total rubes to unauthorized sites when they really wanted expensive, inconvenient, DRM-laden, limited pay sites, the simple fact is that it's not as easy as they think to "fix" the search results. In many ways this is similar (or perhaps it's just another version of the same exact thing) of the industry talking about how it's "easy" for ISPs, online service providers and everyone else to "just know" when a song or video is infringing -- but then are so confused that they sue over videos they themselves uploaded. Knowing whether or not something is infringing is not as easy as the industry insists. Similarly, knowing what's a "good" site and a "bad" site isn't so easy either. How would you approach it? You could just take a list from the RIAA & MPAA of "good sites" and "bad sites." That raises a bunch of problems. Let's just start with antitrust. Two trade associations representing the biggest record labels (who've had antitrust problems in the past) and Hollywood studios giving Google (already under antitrust scrutiny) a list of winners and losers? Er... DOJ on lines one, two and three. No way is that legal. Even if it was legal, not everyone agrees who is "good" and "bad." It's easy for the RIAA and the MPAA to insist that Megaupload -- for example -- is unquestionably "bad." But... then you have major label artists and super successful indie artists speaking out against the shutdown, pointing out that there were plenty of good things about the service. Why does the RIAA get to decide when some of its own artists feel otherwise? The RIAA and MPAA don't have a very good history of recognizing a "good" new thing when they see it. In fact, they seem to scream bloody murder (sometimes literally in the case of the VCR) when new useful tools show up. Letting them program Google's search results seems fraught with problems. If search engines let the RIAA and MPAA program their results to point to "good sites" and suppress "bad sites," where does it stop? For years we've seen lawsuits against Google from companies that don't like how they show up in the search results. Why don't they get to reprogram Google's results too? Or pick any random industry out of a hat. Car dealers? I'm sure when you do a search on a car they want results to point to a "good" local dealer, rather than a "bad" site that tells you how to get a better deal on a car. Imagine having to do that at scale where every industry has its own interpretation. And then what happens when those interpretations conflict? Okay, so if they don't just give Google a list, how does it "know" the "good" sites from the "bad" sites? Again, remember with Megaupload, we've seen plenty of artists say they like the site or its offerings which actually help them make money. Can Google just assume? How? That's not how Google works. If you have any sense of the scale under which any search engine works you know that's an impossible task. There's no way to just know -- especially since sites that are "downgraded" are likely to just set up shop somewhere new and start again. So at scale, the problem becomes even trickier. What if there was a "proxy"? Ok. Like what? DMCA notices? If a site gets lots of DMCA notices, it must be bad, right? Okay, so look at ChillingEffects... and you realize that the sites that get the most DMCA takedowns are sites like Google, Facebook and Twitter. It does't seem like a very good proxy, because sites that are popular get lots of takedowns. It doesn't mean they're "bad." An "independent" third party? Who is the third party? How do they take into account the issues above? And, again, if you're doing that for one industry, you'd have to do it for all. And that simply doesn't work at scale. In the end, I can't actually see any way that Google can do what the industry wants. I know that someone in the comments below will link to some random site and say something to the effect of "how can Google say this site is legit?!?!" but that ignores how Google actually works. It's an algorithm. It doesn't look at sites like a human does. At scale there's simply no way that Google can have a human check each of the sites in its index. The problem is that Google isn't designed to prop up the entertainment industry's old business model. It's designed to provide people results for what they're searching for. Those may be two different things. Google's algorithm does try to give users the "best" result for what they're looking for, and quite frequently that is the legitimate, authorized offering, but it's not always so easy there. iTunes sales are mostly done through iTunes' software, rather than on the web, which makes it difficult for Google to track link popularity there. Amazon music and movie sales often initiate from Amazon's own search, rather than Google -- so, again, Google has less data to work with. Furthermore, if someone does a search for the name of a movie plus "download" when that movie isn't available for download, what is Google supposed to do, exactly? If the movie industry weren't so obsessed with release windows, Google could point people to the authorized download. But without that, how is it supposed to do that? If there is no authorized download, it's going to try its best, and sometimes that's going to be to an unauthorized source. In the end, for those who keep insisting that this is somehow an obvious solution, and complaining that Google isn't helping, I'm wondering if you can actually explain how it can do a better job, because the more I think through it, the less I think it's even remotely possible for Google to do what the industry wants. How Do The NY Times Paywall Results Compare To Its Last Paywall? One of the oddities in the NY Times introducing its recent emperor's new paywall is the fact that the NYT already played this game and failed a few years ago. Back in 2006, over a year before the NYT finally realized this was a dumb idea, we had pointed out that it appeared its subscriber numbers had totally plateaued, foreshadowing the end of the paywall. I was reminded of that after some were saying that the NYT's recent announcement of 100,000 subscribers to its (still discounted) paywall shows that it's on a path to success. With that in mind, it's fascinating to see Joshua Benton, over at the Nieman Lab, compare the results of the TimesSelect paywall with this new paywall, and suggest that the initial results aren't really that impressive in that they track the results from last time. 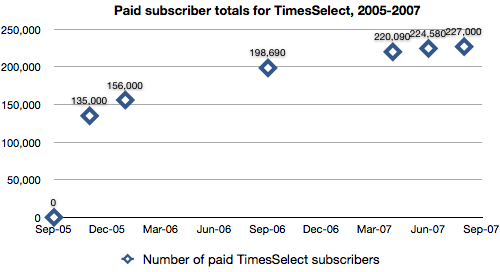 After scouring reports to find out how many people signed up for TimesSelect, he put together this chart that shows the clear plateau: So it looks like the last time around, they quickly jumped out to about 100,000 subscribers... and then things slowed down and they had to slog it out for new subscribers. This time around the paywall situation is definitely different. This paywall covers the entire NY Times, but is much more leaky. So you have one force pushing more people to subscribe... and another that diminishes the reasons to subscribe. But the key point remains. The success (or failure) is going to be determined by how many people the paper can convince to keep signing up... and I'm going to go out on a limb and suggest that the NY Times is going to find it hard to grow this part of their business in any significant way over time. The content of this t-shirt has been removed due to a DMCA takedown notice. Consider the message on the shirt a good way to engage people in a conversation about the abuses of copyright law and the DMCA. The hoodies come with a copy of my Approaching Infinity book, while you can get the t-shirts without the book or with the book. After seeing many musicians setting up various interesting/amusing "tiers" of scarce value worth buying, while also working to connect with fans, we decided to launch our own CwF+RtB tiers, at the end of July, as an experiment to see what we might learn. We knew that this sort of thing worked for music, but had no idea if it would work elsewhere -- say, for a blog. It wasn't designed to replace our existing business model, but just as an experiment to see what would happen -- and what we could learn that might help others implementing similar business models. I should apologize, as this post detailing the results is way, way, way overdue. We had most of the results and lessons within about a month, but this is a big post to write up and I kept procrastinating. No good reason why: there was just always something going on in the news that seemed more urgent and every so often I do like to catch up on sleep. The quick summary: we consider the experiment to have been a huge success. We brought in approximately $37,000 total due to this experiment, mostly in the course of that first month. Nearly $12,000 came from direct sales to individuals of the tiers between $5 and $150. As was revealed in an article at Wired, another $5,000 came from an individual, Didier Mary, who was working on a business plan and bought the Techdirt Reviews Your Business Plan package. The package included an Insight Community conversation, which recently concluded, about his business model idea. Didier has told us that "it was a great experience" and very useful to him in moving forward with his plans. Another $20,000 came from larger companies, which purchased Insight Community packages after learning about them through this effort. The effort also resulted in potential future deals, as it led many more companies to contact us to learn more about the Insight Community. Other companies, with whom we were already talking about the Insight Community, contacted us after we launched this, with one noting that if what his company had been discussing with us was on the list, he probably would have just "clicked buy" right away (though, with that company, we're still discussing a deal and have not yet completed it). Ignoring the higher end Insight Community deals, the average amount paid by users was over $70. This was significantly higher than expected. Sales came from 15 different countries around the globe. North America and Europe were obviously the biggest, but we also got sales from Asia, South America and Australia (no Africa). The international sales might have been bigger if we had launched international sales the same day we launched the overall effort. Unfortunately, we didn't have all the details on that sorted out until a week later, and I think we probably lost some international sales that way. The US Postal Service does make international sales much easier these days -- especially with its "one rate" boxes, but shipping is still really expensive, and many countries then add annoying tariffs on top of everything. This was annoying, but (unfortunately) unavoidable. Our highest selling item was not the cheapest, second cheapest or third cheapest offering (contrary to the claims that people just want the cheapest item). Instead, the biggest seller -- by a pretty wide margin -- was the Approaching Infinity package, that included both a copy of my book and a t-shirt. For quite a while, the hoodies (which we almost didn't offer) outsold the t-shirts... but in the end the t-shirts barely passed the hoodies. The Techdirt Book Club outsold the Techdirt Music Club by a factor of three. No one bought the Day with Techdirt package, though we actually got a lot of inquiries about that, with multiple people who don't live in California saying that if they were closer, they would have bought it. This is still available, though. And, fear not, no one bought the $100 Million Silence Techdirt offer (still available as well! ), though we did get a few people who were worried that someone would actually take us up on this -- and one satirical offer from someone claiming to be from the RIAA, which made me laugh, saying the RIAA would pay up, but wanted to guarantee "exclusive rights" to the RIAA, such that it would be able to "pursue appropriate legal action against any and all 3rd parties that make use of this silence purposely or inadvertently" including, of course "the right to pursue similar action against any individuals who are also not reading Techdirt and therefore infringing on our own licensed agreement to be the sole recipient of a Techdirt-free world." Brilliant. However, the $100 Million Silence Techdirt offer did get the most traffic of any of the tiers, by a factor of three -- though, it also drove many people to check out the other tiers. This works! These sorts of models can absolutely work in connecting with fans and in making money. All of you, in our community, are awesome. Not just for buying, obviously, but because the overall response we got was incredible. This included many really, really nice emails that made us feel great, along with happy emails and Twitter messages from people receiving their packages, and telling us stories about wearing the clothes, reading the books, etc. It's fun making people happy. Really. It really gave all of us here at Floor64 a great feeling every time we heard back from happy community members. Logistics and inventory management are more complicated than you expect. We sort of knew this ahead of time, but you realize it first-hand when somehow, somewhere copies of signed books go missing, and you suddenly need to ask for an author to send extras. Also, dealing with sourcing inventory from so many different people for the Book and Music club is doable, but takes a lot of time to manage. Though, I have to say, every one we worked with -- from authors and musicians to publishers, agents and record labels really were fantastic. We didn't have even the slightest trouble from any of our partners in this endeavor. Shipping out the products definitely was an effort, but we tried to make it fun, with a group of us working together to package up and ship stuff (and on this one, the team here, lead by Gretchen, did a fantastic job, going above and beyond to get everything organized and shipped). Having lots of options was a good thing because we weren't very accurate in predicting what would sell. We came close to not offering the hoodies at all, but those were incredibly popular. You can't keep everybody happy, but you should try! We had to set up a better process for "customer support" as we launched this (nice job, Dennis!) and then work with and respond to customers who had questions or (in a few cases) problems. A few times the problem was that we did not explain things clearly enough, and sometimes there were problems with shipments (or, in one case, a hoodie that was frayed). But we tried our best to make sure everyone was happy and hopefully succeeded (mostly). What you're selling should match your audience. The Book Club sold really well. The Music Club, not as much -- despite being awesome (seriously, the combined Music Club items are really, really cool, and the music is great as well). But, in retrospect perhaps that made sense, as the books in the Book Club directly related to everything we talk about here. The Music Club, while supporting artists who did things that we talked about here, was a bit different, and required people to like the music as well, which is a lot more subjective. Bundling together four separate musicians with different styles was, perhaps, not a great idea. On top of that, we perhaps did not do enough to promote the music itself to get more people to enjoy the work of those musicians. Finally, while some of the offerings were "unique," others could be purchased elsewhere, which limited the "scarcity" of the overall package. Some promotions worked really well. The first promotion we did was offering anyone who bought both the music and book clubs together a choice of either lunch with me or a free hoodie. This helped motivate a bunch of folks to step up and buy -- and resulted in a handful of lunches. Having lunch with people was really, really cool. I have to admit that I was a bit nervous going into the lunches from the above promotion, but they were all really amazing, often in very different ways. Each individual was really interesting and the conversations were quite engaging and thought provoking and fun. I'm pretty sure every lunch ended up lasting well over the allotted hour. I ended up learning a lot and had a great time at every one. I'm hoping to set up more ways to do things like that, if not the same thing. Even the tiers that didn't sell, still generated interest in other things we were doing. A bunch of people contacted us about the Day With Techdirt package, and while no one bought it, many of them bought other packages instead. Not everyone who says they will buy will buy, but that's okay. It was interesting to note that some people who told us they would buy (or even announced it on their Twitter/Facebook feeds) never actually did buy for whatever reason. That's fine, of course. Everyone is free to do what they want, but it was interesting to note. Just because someone says they'll buy, it doesn't mean they will. Communicating directly with everyone can be difficult. While others here handled customer service requests, I started getting a bunch of emails personally from people who participated, sometimes with long and detailed questions. I tried to reply to most of these, but it was difficult, and I'm sure I missed a few. Anyway, that's the basic summary. This really has been a lot of fun and quite educational at the same time. We've still got lots of things planned and will be trying a few new things as well, but thanks to everyone who participated and a big thanks to all the authors and musicians who partnered with us, along with the team here at Floor64 for helping to make this all work.